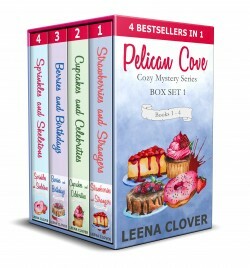 If you like reading about strong women, small town life, friendships that endure and yummy food with a side of murder, you will love the Pelican Cove Cozy Mystery series. This cozy mystery anthology brings you fast paced murder mysteries with twists and turns and plenty of suspects and red herrings. Every book in this set has been a bestseller and has entertained thousands of readers.